Sooji ka halwa/ Semolina halwa also called Rava kesari is a very popular sweet of Tamilnadu. It is made from semolina and sugar and tastes delicious. 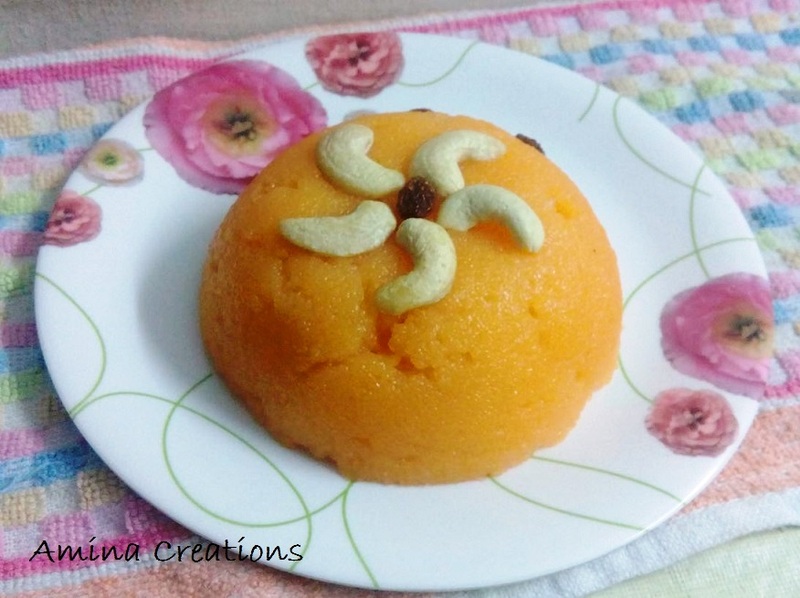 Rava kesari is one of the most delicious, easy and quickly made sweets in India. Using the recipe given below sooji halwa/ rava kesari can be made in about 15 minutes. Heat ghee in a pan, when it starts melting, add the cardamom seeds and the chopped nuts. Cook for about 2 minutes till the nuts turn golden. Then add water and sugar and mix well. Keep stirring and bring to a boil. Then add the semolina and continue to stir otherwise the halwa will stick to the pan. When it starts boiling, close a lid and reduce the flame to a minimum. Cook for about 5 minutes and switch off the gas. Allow it to cool and remove in serving bowls. It can be served hot or cold.